Using a virtual platform in which to learn a language has become popular recently, but the games often times seem forced. Usually, either the educational aspects overwhelm the fun or vice versa, but in the case of Learn Japanese to Survive: Katakana Battle, the developers at Sleepy Duck have found a happy medium between learning and playing. The player first meets a crew of first­time Japanese learners from all different countries and a Japanese teacher of whom you can choose to be in your party. As per usual with party­based RPGs, each character has a distinct character class. One of the most apparent differences between this game and other education­based RPGs is the commitment to the actual gameplay. Many of the conversations that you hear and are acted out by voice actors, rather than the random sound bite here or there. The voice talent is surprisingly well done and uses correct colloquialisms and pronunciations in English and Japanese. Your team of foreigners come across some strange monsters in the form of Katakana symbols who are terrorizing the city of Osaka. Using your newfound knowledge of Katakana, you are to vanquish the monsters by calling out the correct syllable that matches the symbol. This is where many educational games stop. The player goes through the lesson, the player plays a game where they must use what they learned in the lesson to complete a challenge, and then rinse and repeat. Katakana Battle, on the other hand, also creates a fully­fledged turn­based RPG. It has a relatively complex storyline, character­building mechanisms, and a myriad of equipment and items that all have to do with Japanese culture or that teach the player Japanese terms. There are even a couple of vendors who don’t speak English, and though you can buy from them at any time in the game, you won’t know what you’re buying until you learn to translate it from your studies or already speak the language. Each character that you choose for your party gains affection for your main character the more you fight with them. If their affection level is high enough, it unlocks a cutscene where you learn a little more about that character, and the camaraderie that they feel towards your character gives them boosts in battle. Each character is also given magical attacks and buff spells for the party. Though the player cannot defeat a Katakana monster on magic alone, it does well to weaken the monster before naming it, which is always coupled with a physical attack. To implement the physical attacks, you can choose from a huge amount of weapons, including different assortments of swords, bows, melee weapons, staves, and even electric guitars. 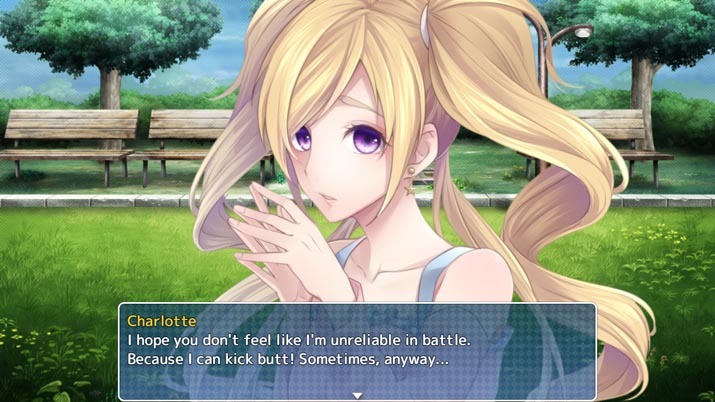 The actual battle mechanic is like any other turn­based system, except instead of “Attack” at the top of the menu, the choice is “Answer.” When the player clicks the “Answer” option, it allows the player to choose from a chart of syllables that the player has already learned from the previous studies. You then pick the corresponding syllable that matches the Katakana monster’s symbol, and deliver a physical attack. If the player chooses the wrong syllable, it does zero damage to the monster. Each location that must be cleared has a different level of monster, depending on what the player has learned in the lessons. If the player approaches a monster whose symbol hasn’t been taught yet, it knocks the character back, denying the player entry into that particular location until the player learns that set of symbols. There are optional side quests that the player can choose to accept from people around town. As a show of gratitude for completing the quests, the townsperson will give a short lesson in common Japanese words and phrases. Words and phrases are also learned in the formal lessons as well, the further the player gets into the game. As a fluent speaker of 3 languages, one of which required learning a new alphabet, this is one of the best virtual introductions to a new language I have ever seen. 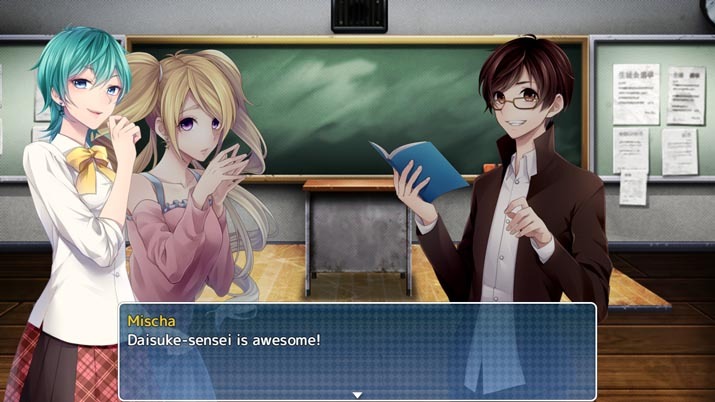 Not only does it give the player a well­rounded a easily­consumable introduction into learning to read and write Katakana, but it also allows the player to immerse in the culture and understand colloquialisms. Even without the educational part, the gameplay itself could stand alone as an enjoyable turn­based RPG. The game could use a little more discovery and exploration, and some sort of writing and speaking mechanism, a la Rosetta Stone or Duolingo, would make the learning of the language a bit more well­rounded. Coupled with the previous game, which taught the player the Japanese Hirangana alphabet, one could be well on their way to learning the Japanese language while immersing themselves in a genuinely fun game.